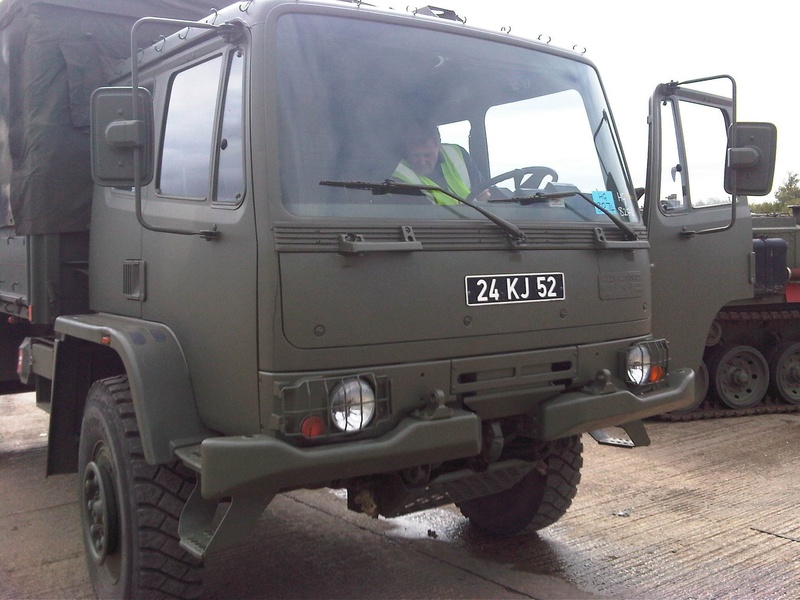 We bought the Leyland Daf T244 from Whithams, the military disposal centre, as a canvas backed troop carrier in September 2011. It was an epic day out, rummaging around the armoured personal carriers, tanks, jet ski’s, and of course 4×4 trucks, in search of the elusive good condition, low mileage, left hand drive base for an overlander. We were mob handed, along with my big brother Alan, we had Ed Perry (the owner of Overland Vehicles LTD), and his mechanical engineer. We knew that because we insisted on a LHD, the choice was much more limited, and indeed the vast majority had been abused over time and in quite tatty condition. Eventually we were approached by one of the staff there and asked what we were actually looking for, and hey presto, the perfect base truck was driven round from behind one of the vast sheds. A LHD 18 year old, very good condition truck, showing a grand total of 1700 miles (mileage not guaranteed, but it certainly hadn’t had a hard time). Paperwork was done, cash paid, and we went away happy. 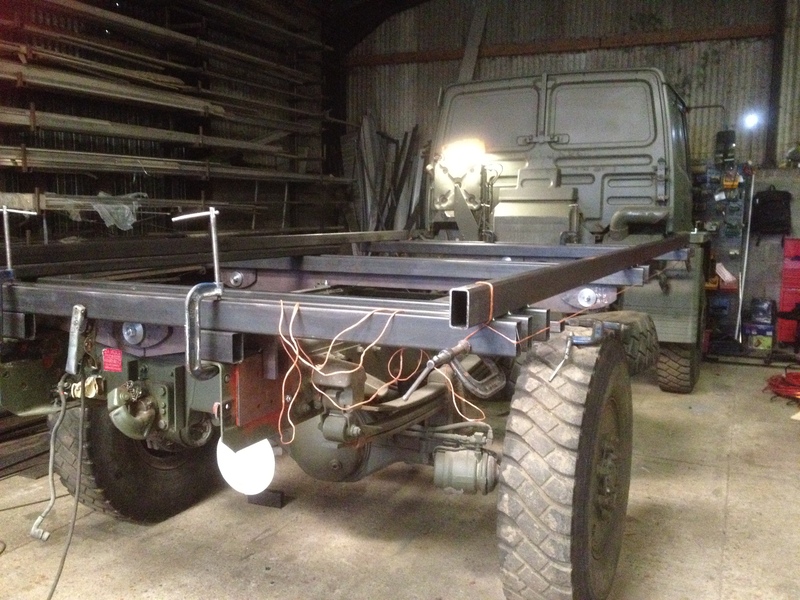 Two weeks later the truck was delivered on a low loader to Overland Vehicles in Suffolk, and Ed Perry started stripping out the rear of the truck taking it right back to the chassis rails. The above photo shows the new metal work being fitted to the main chassis rails, this is all built up on a Torsion Free System, so the main chassis rails can twist, once all the suspension travel is used up without the rear cabin being ripped off or broken. 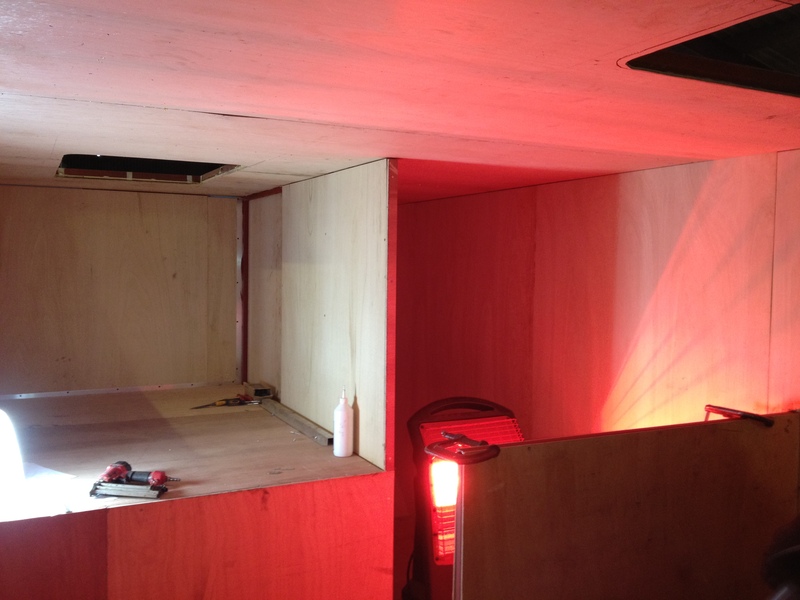 The next job was to construct the floor, and steel box section walls and roof. 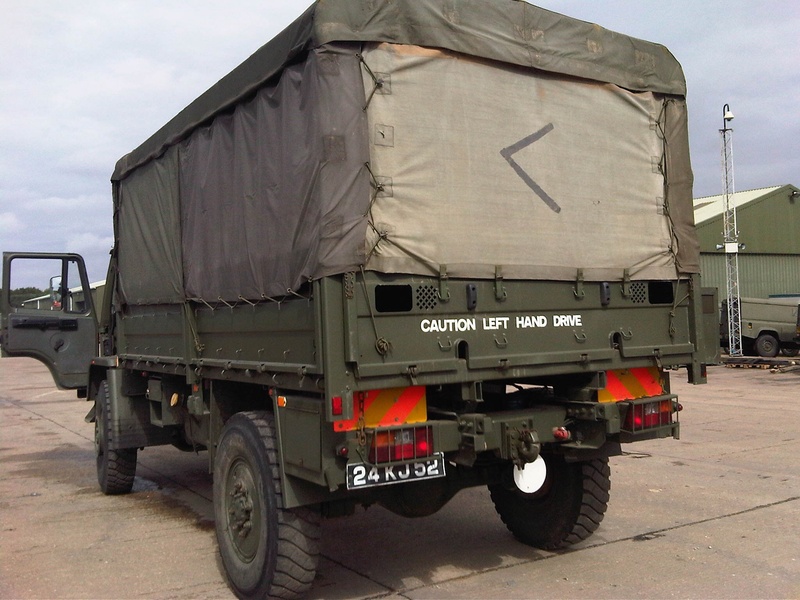 The angled slope at the back of the truck is to increase the departure angle. 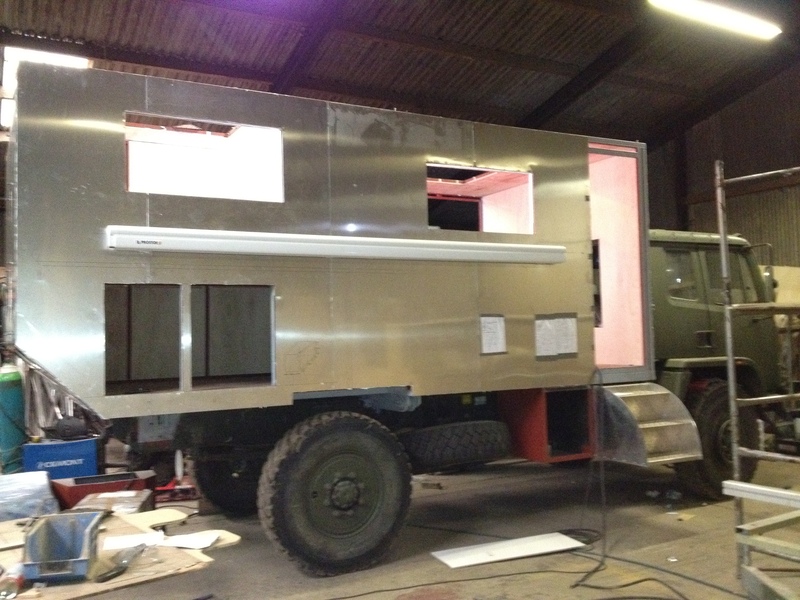 We decided to go for the heavier but stronger, and easier to repair method of construction of insulated steel box section, clad in sheet aluminium (with a isolating sealant between), rather than the plastic insulated panels of many continental Overland campers. 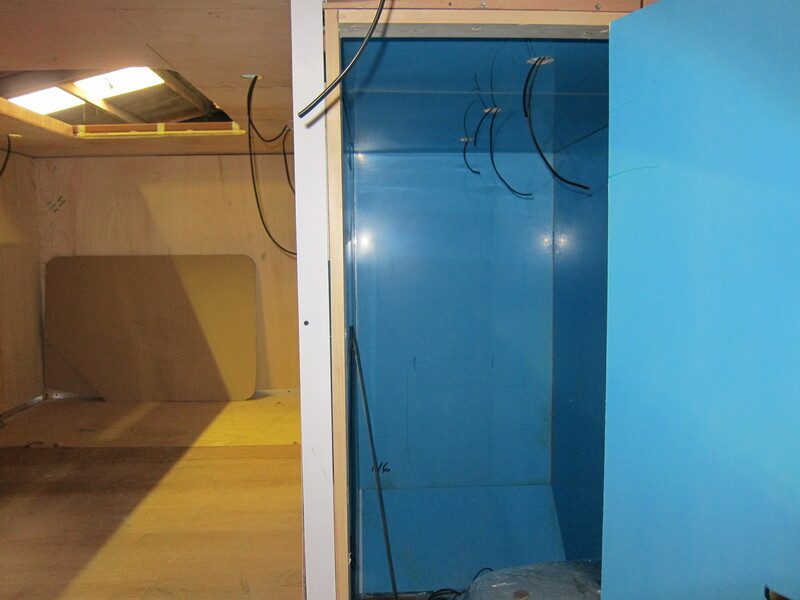 Inside the steelwork is another 50mm of insulation, that is then clad in plywood with a white finish. We agreed on an internal layout with Ed Perry, comprising of a permanent double bed, bathroom with full-size shower, dining area that converts into a second double bed, and a functional kitchen. 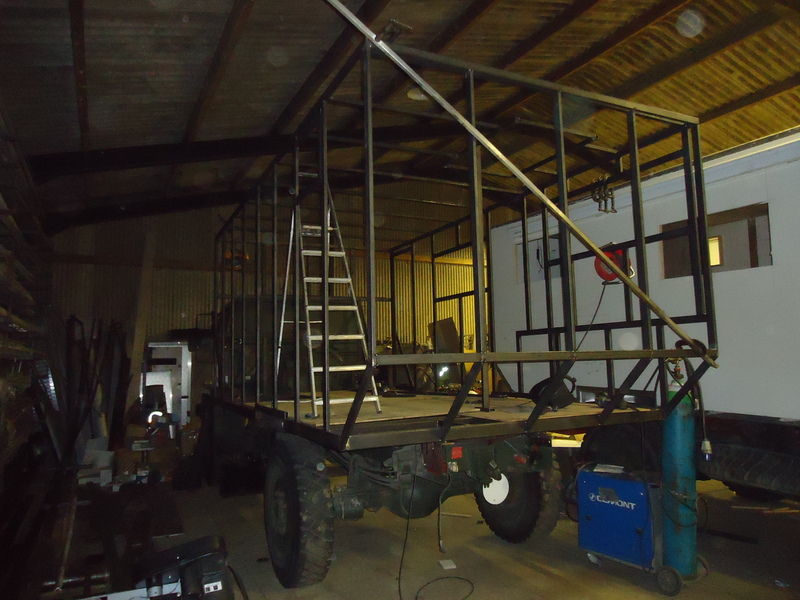 Work on the truck, carried on at an amazing rate, with sometimes up to 4 guys working on it at any one time, water tank was fitted, electric’s were fitted, windows, roof lights and doors installed, and the interior started to take shape. 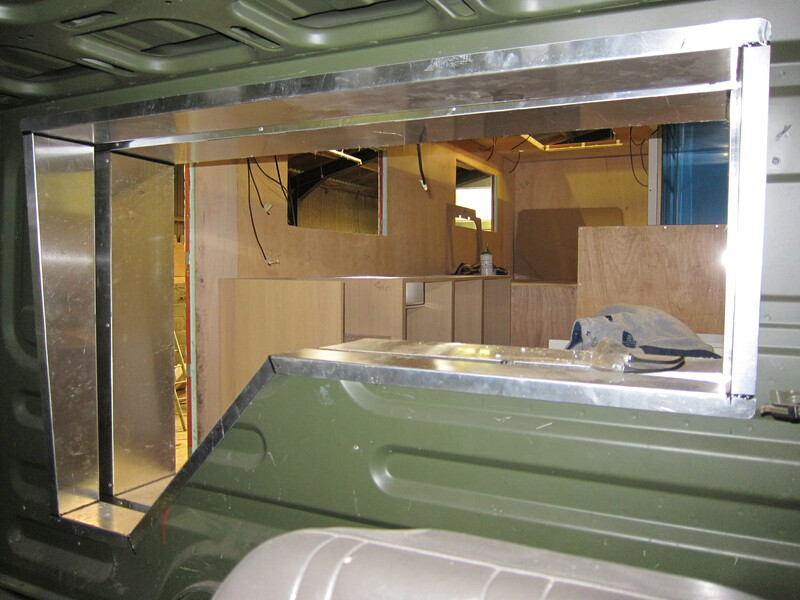 The above photos show the bathroom and bed area, and then the view through the cut-through from the cab to the cabin. Ed Perry at Overland Vehicles proved to be a very helpful guy, always willing to change things if we decided that something wasn’t going to work for us, or indeed if he had a better idea. 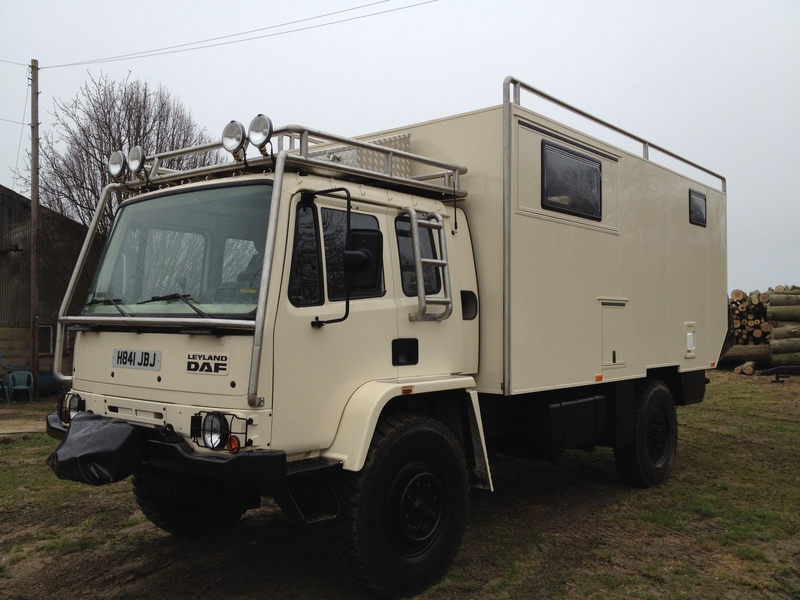 Ed had built quite a few Overland vehicles on different chassis, including Unimogs, Mercedes, Man, but mostly on the simple but very strong Leyland Daf platform (see Why a Daf?). Each of his layouts are slightly different, and its just a case of designing a layout in a 2.4mx5.0m box that suits you and maximises the available space. Details like where you have the door, radically alters the possibilities for kitchen and dining area. 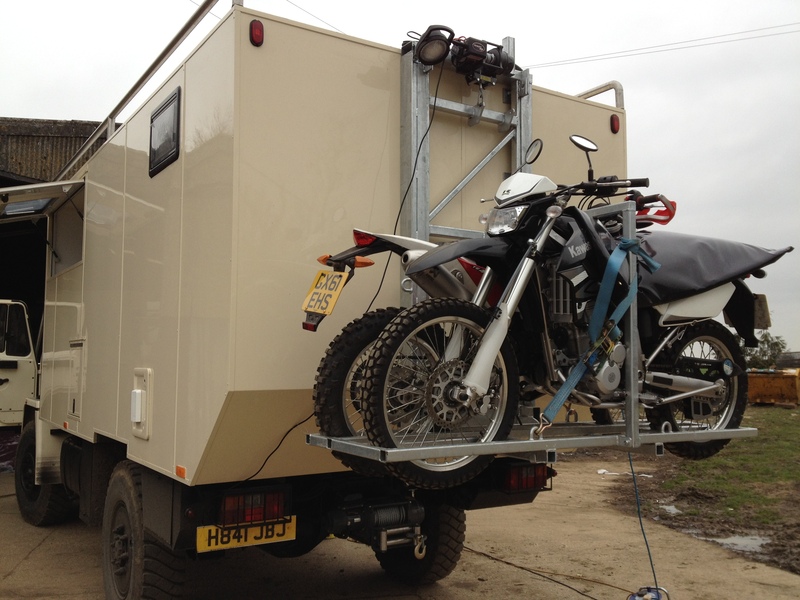 Our original idea was for a rear rack suitable to take 2 dirt bikes (a 450 Husquvana, and a 250 Kawasaki), this was no problem for Ed and his boys, fixing points were built into the rear of the truck and a galvanised rack constructed with a 4500lb winch installed to hoist them up (and lower them down of course). Once windows, doors, and locker hatches had been installed, the bike rack removed, long range fuel tank fitted, it was off to the spray shop for a bit of finishing. After a lot of thought we decided to go for a light, non military type colour, and after looking a few cars we settled on VW Beetle Harvest Moon Beige, as on the 2006 model. We decided from the off that due to the tough terrain that the truck was going to cover, we need some protection for the cab and the corners of the cabin. With this in mind Ed has some stainless steel tubing made up that also formed the roof rack on the cab, and protection for the air conditioner unit on the cabin roof. Access through the observation/machine gun hatch has been maintained. 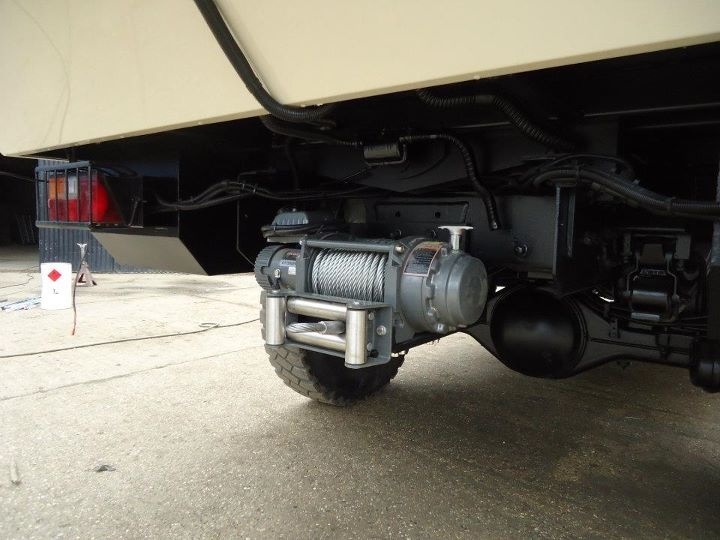 For recovery, we had a 24v winch rated to 17,500lb fitted to both the front and the rear of the truck, these required heavy duty mounting plate to be fitted to the chassis, and hopefully these will prove to be man enough when used with pulley blocks etc (as long as there’s something to hook up too!). 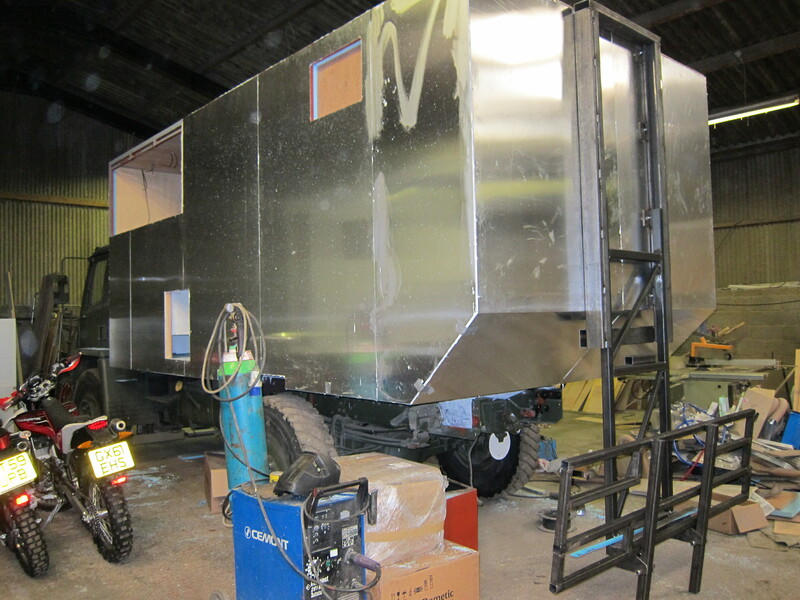 At this point we were visiting the truck every weekend to check on progress, and finalise details. 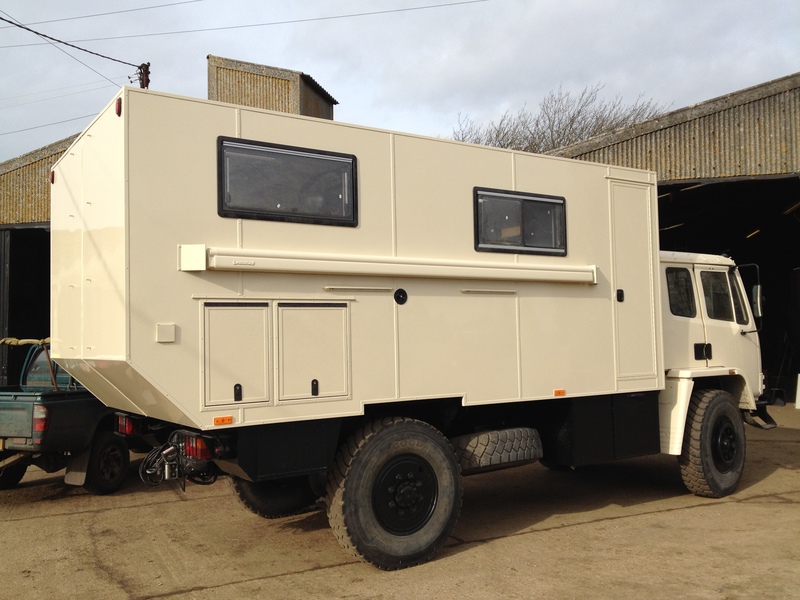 The bike rack came back from the galvanising, and was refitted to the rear of the truck, the generator was fitted and wired up, fridge’s fitted in cab and cabin, bathroom fitted out, and general finishings completed (nearly). Inside was about 90% complete when I got a call from Ed to say that Overland Vehicles Ltd was just about to go in Administration! I panicked a bit, but Ed assured me that the truck would be registered, MOT’ed, and finished as much as possible within a week, and that I needed to sort my Insurance out so that I could pick the truck up with only a days notice. 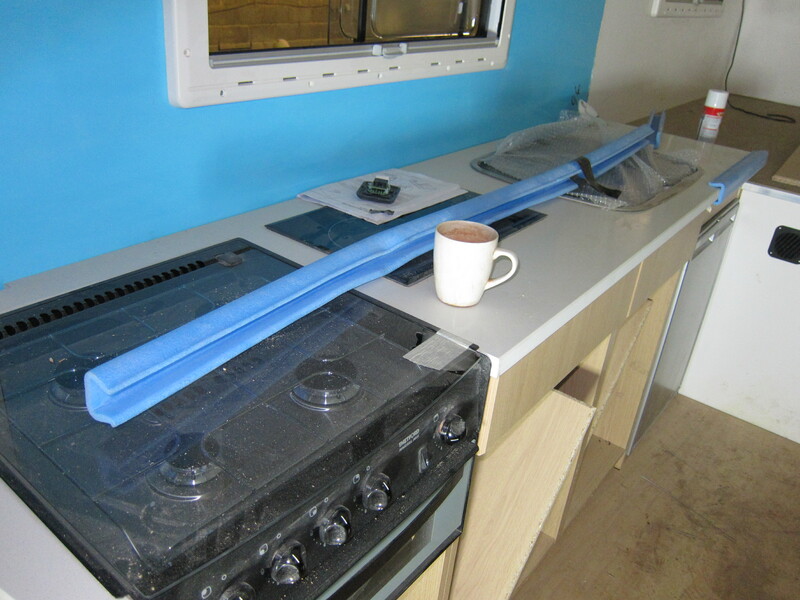 And true to his word, when we turned up to collect the truck, it was virtually finished, just a few minor things such as fans not fitted (as he couldn’t buy the units anymore), but the wiring was in place for them as agreed. 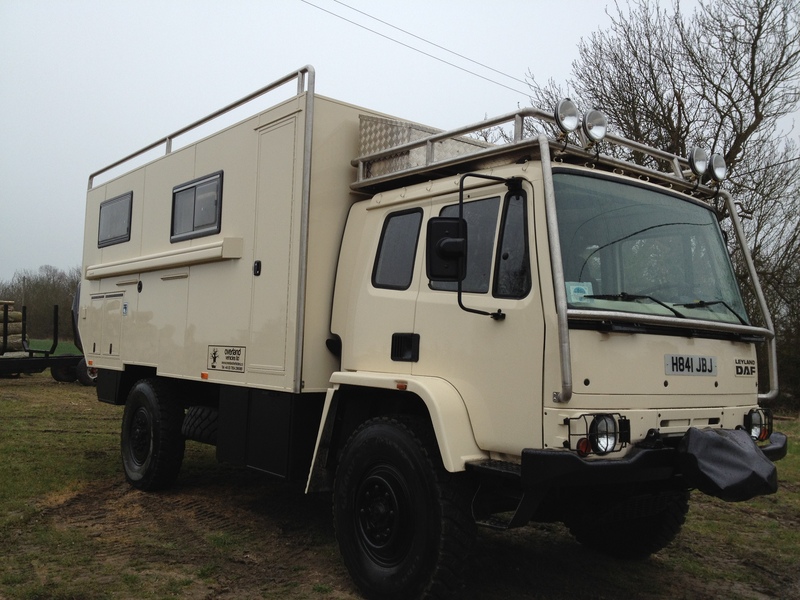 The truck was driven away from Overland Vehicles in March 2012, in six months we had gone from buying a military 4×4 truck to having a camper van on steroids! Now all we need is a few trips. 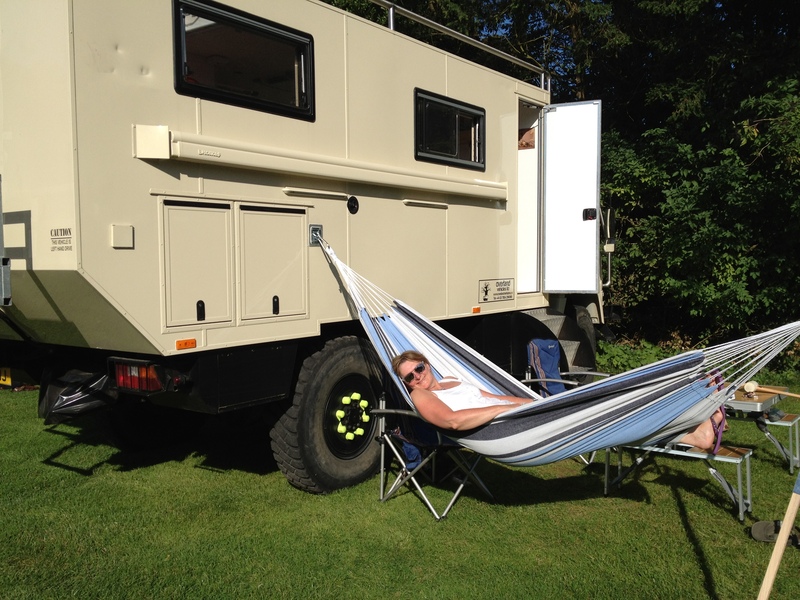 We are impressed – very well done – both thumbs UP!! Do you have some Information for me how you mounted the front winch? Nice, any advice on who stocks spares for these trucks? I cannot wait to show my husband this – so amazing!! Any info / advice on insurance, kerb weight & licence requirements ? Hi Dan, thanks for your comments about dear old Colonel K, it really is looking after us! We do our insurance through Adrian Flux. We decided early on not to try for a less than 7.5 tonne as its difficult to build a suitable box and kit it out as we want and stay under 7.5 tonne, so we both took our HGV test and at our last weigh bridge here in Africa (there are many, and all compulsory if over 3.5t) we went 9.2 tonne, fully loaded and about 200-250 litres of water on board. 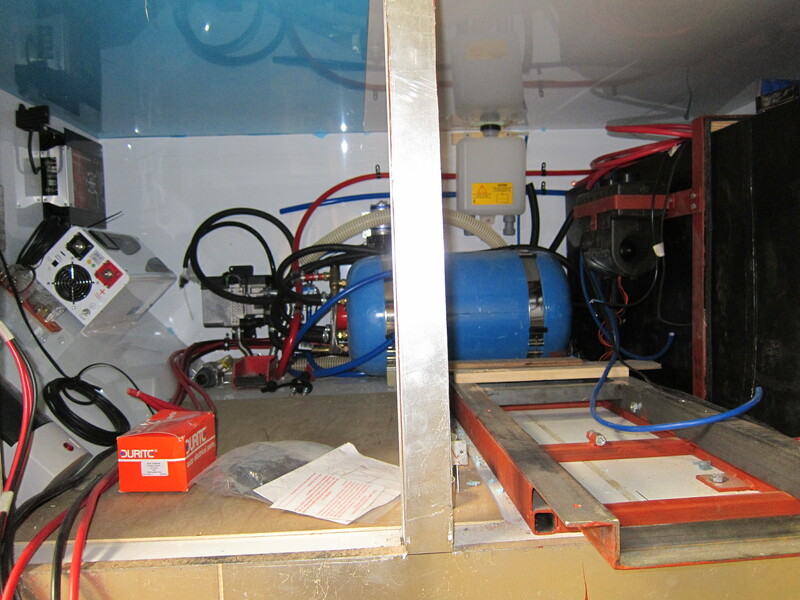 Do you have any pictures or diagrams of the torsion free mounting system?